On Assignment – The Giants Win the 2014 World Series! Game Seven of the 2014 World Series provided some welcome drama to the 2014 Fall Classic that was lacking in Games Five and Six. 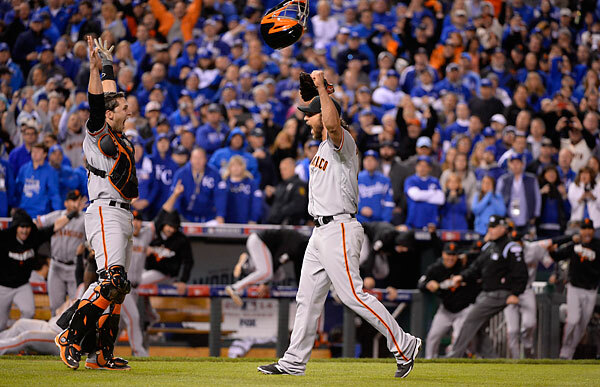 OCTOBER 30 – KANSAS CITY, MO: San Francisco Giants catcher Buster Posey #28 (L) celebrates winning the 2014 World Series with Series MVP Madison Bumgarner #40 after Salvador Perez #13 of the Kansas City Royals fouled out to Pablo Sandoval #48 on October 30, 2014 at Kaufmann Stadium in Kansas City, Missouri. (Photo by Ron Vesely/MLB Photos). Should Alex Gordon have tried to score on his 9th inning, two-out single turned “three bagger”, thanks to Gregor Blanco? I’m going to venture a guess that question may be asked in the Kansas City area for quite some time. It’s easy to play couch coach, but, hey, I’m a risk taker and I would have made a run for it. 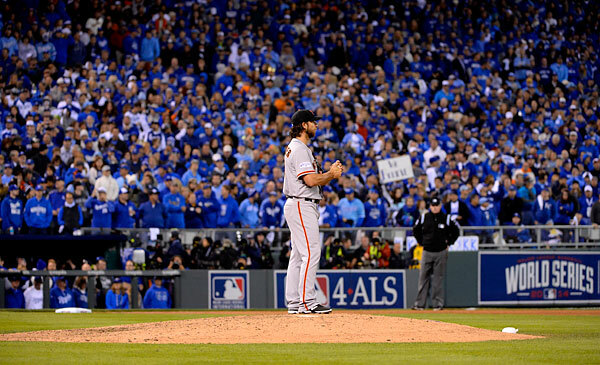 I mean, it was only World Series (and NLCS) MVP Madison Bumgarner of the mound for the Giants. 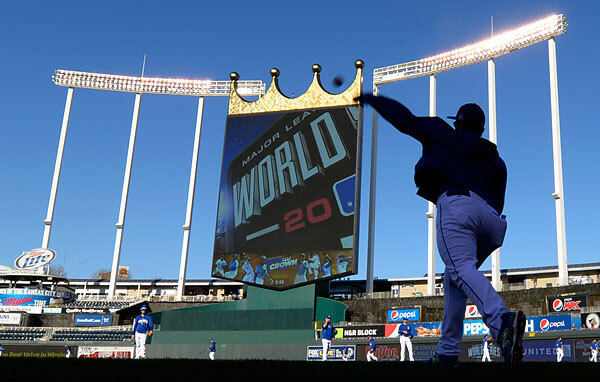 OCTOBER 30 – KANSAS CITY, MO: Jason Vargas #51 of the Kansas City Royals warms up prior to Game Seven of the 2014 World Series on October 30, 2014 at Kaufmann Stadium in Kansas City, Missouri. (Photo by Ron Vesely/MLB Photos). 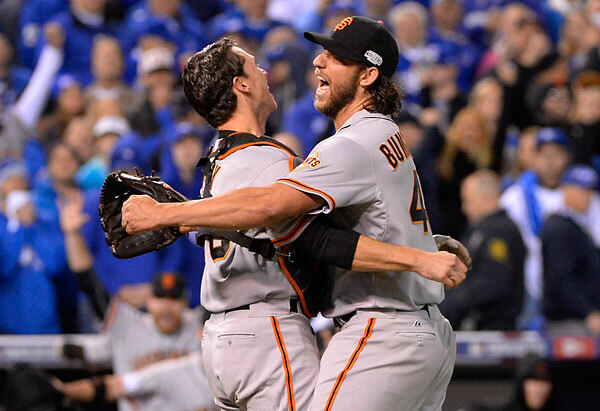 The same Madison Bumgarner who now sports a 0.25 ERA over three World Series! 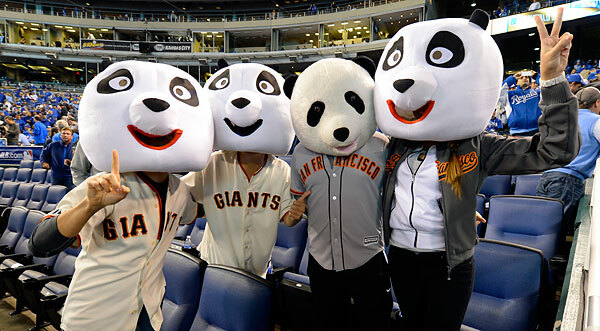 OCTOBER 30 – KANSAS CITY, MO: The famous “Panda Fans” pose for a photo prior to Game Seven of the 2014 World Series on October 30, 2014 at Kaufmann Stadium in Kansas City, Missouri. Best line I heard during the Series… After taking the photo, one of the “Pandas” asked.. “Did I blink”? (Photo by Ron Vesely/MLB Photos). History was made in Game Seven as baseball fans watched in awe as the unflappable and nearly un-hittable Bumgarner came in to relieve ex-Royal Jeremy Affeldt to start the fifth inning. If I was a Royals fan (and I was, loyal to my American League Central Division “heritage” as the White Sox team photographer), I would have been freakin’ out when I saw Bumgarner begin to warm up in the fifth. 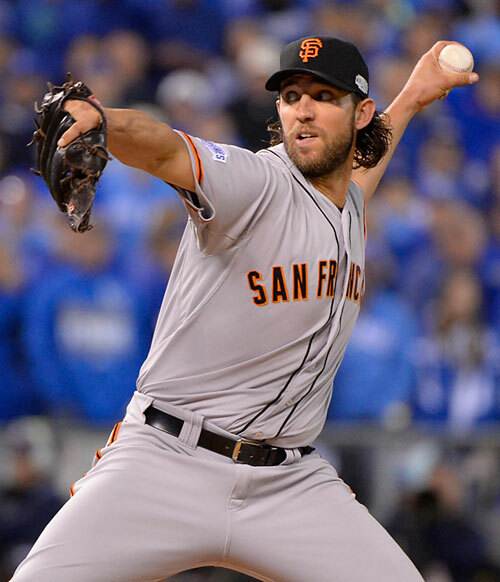 OCTOBER 30 – KANSAS CITY, MO: Madison Bumgarner #40 of the San Francisco Giants pitches during Game Seven of the a2014 World Series against the Kansas City Royals on October 30, 2014 at Kaufmann Stadium in Kansas City, Missouri. (Photo by Ron Vesely/MLB Photos). After giving up a single to Omar Infante to lead off the inning (and send false hope to the Royals faithful), and the 9th inning single to Gordon, Bumgarner remained cool and calm as he has been throughout the entire postseason to lead the Giants to their third World Championship in the last five years. 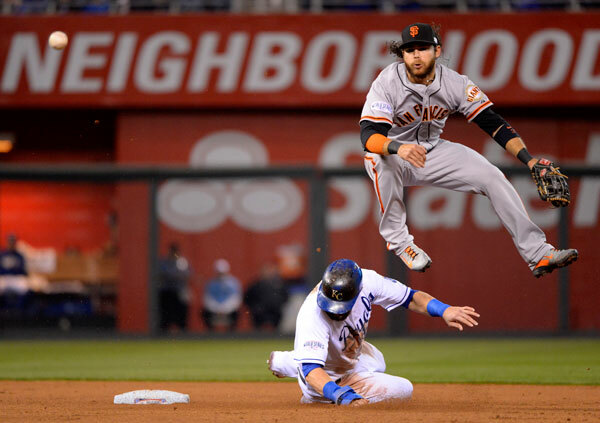 OCTOBER 30 – KANSAS CITY, MO: Brandon Crawford #35 of the San Francisco Giants turns a double play over the sliding Alex Gordon#4 of the Kansas City Royals in the fifth inning of Game Seven of the 2014 World Series on October 30, 2014 at Kaufmann Stadium in Kansas City, Missouri. (Photo by Ron Vesely/MLB Photos). 2010, 2012 and now 2014. I think it’s safe to say that these boys of summer from the City by The Bay can be considered one of baseball’s great dynasties… Yep, I said it. OCTOBER 30 – KANSAS CITY, MO: Madison Bumgarner #40 of the San Francisco Giants prepares to face Alex Gordon with two-out in the ninth inning during Game Seven of the a2014 World Series against the Kansas City Royals on October 30, 2014 at Kaufmann Stadium in Kansas City, Missouri. (Photo by Ron Vesely/MLB Photos). And as for Bumgarner? Arguably, perhaps, the best World Series pitcher ever. Maybe not even arguably. I love covering history! 4-0 with 1 save and a 0.25 ERA over 36 innings spanning three World Series? Yep, I would have sent Moustakas! But, with Moustakas watching from third base, Bumgarner induced Royals catcher Salvador Perez to pop up to an anxious Pablo Sandoval to seal the deal for Bumgarner and the Giants. 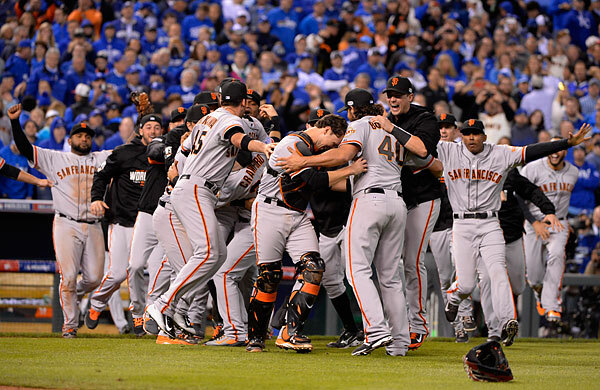 OCTOBER 30 – KANSAS CITY, MO: The San Francisco Giants celebrate winning Game Seven of the 2014 World Series against the Kansas City Royals on October 30, 2014 at Kaufmann Stadium in Kansas City, Missouri. (Photo by Ron Vesely/MLB Photos). I can’t wait to look over the parade pictures by my pal and MLB Photos teammate Brad Mangin. This entry was posted on Friday, October 31st, 2014 at 8:07 PM	and is filed under Assignments. You can follow any responses to this entry through the RSS 2.0 feed. Great photos, Ron. I love reading your World Series game summaries every season. Just wanted to mention that your last paragraph mentions Moustakas being left on 3rd instead of Gordon.